"The law couldn't bring you to justice, but I'll do it with my own bare hands." Even for a devoted Kurosawa fan, this one can slip by the radar, and it's not difficult to see why—it lacks the literary pedigree of something like Throne of Blood, and the samurai swordplay of Yojimbo, and it's not a conventional genre picture, either. 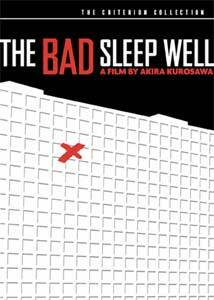 The Bad Sleep Well is part noir, part boardroom showdown, but mostly it's a revenge tragedy—it's not to Hamlet what Ran is to King Lear, but Kurosawa and his writers certainly must have had Shakespeare on the brain, at least part of the time. It is pretty sharp stuff, though, occasionally too didactic, full of corporate inside baseball, and with a couple of apparent dramatic missteps. As Kurosawa films go, it's almost sloppy by comparison—but there's a lot of poignancy and craft here, and features one of Toshiro Mifune's most controlled and modulated performances. Mifune plays young Nishi, rising executive at the Dairyu Corporation, who has the professional foresight to marry the boss's daughter—the movie opens with a wedding sequence, Nishi's marriage to Yoshiko (Kyoko Kagawa), whose father, Iwabuchi, is the Dairyu CEO. Nishi is handsome and dashing; his bride limps noticeably and is painfully shy, suggesting that it's something other than young love that brings these two together. There's the whiff of scandal around Dairyu, though, and the company is haunted by ghosts—tales of an incestuous relationship with Public Corporation, involving millions in kickbacks, led to the suicide of Furuya, a dedicated Dairyu company man who felt that jumping out of his office window was preferable to bringing dishonor to his employer. In a particularly macabre public display, someone has devilishly substituted for the traditional wedding cake a baker's rendition of Dairyu headquarters, a rose sticking out of the window from which Furuya defenestrated himself. A Heathers-like rash of suicides ensues, demonstrating the sort of corporate loyalty that would be an industrial curiosity from another time if it weren't so dangerous. This is one of those plot-driven movies that's difficult to discuss without spilling too much of the story—even the copy on the back of Criterion's case gives away too much, I think, and I'd encourage you to get right to watching the movie, rather than read what I or anybody else has to say about it. But if you're forging ahead anyway: the Hamlet comparisons are commonplace here, and there are obvious affinities (as Chuck Stephens points out in an accompanying essay) with Robert Wise's Executive Suite, but the closest analogue in the West to this story is probably All My Sons, Arthur Miller's devastating early melodrama. They're both about the prices paid in the family for decisions made in the boardroom, and vice versa; they're both about the sins of the fathers, visited upon their sons. And as you might expect, they're both fiercely male stories, with the women around as necessary window dressing—visually here, we're clued in to the precise historical postwar moment, with the men in Western-style business suits, the women invariably in traditional Japanese garb. Compositionally, the movie is kind of extraordinary, and it's also notable for Kurosawa's use of depth of field—the flattened-out look of his later period hadn't become his style of choice just yet, and some of the image he creates, along all three axes, can be breathtaking. And though the slow recovery from the ravages of World War II aren't made explicit, the impact of the war is everywhere—the hideout of choice late in the movie, for instance, is an abandoned munitions factory. Still, it's something of a disappointment that the climax of the film is reported to us, in the manner of a Greek tragedy, rather than shown to us; perhaps Kurosawa wanted to retain some sense of mystery and of malfeasance, but it feels like he kind of sells himself short, giving us a John Grisham ending rather than the bloody apex we've been both hoping for and fearing. That aside, though, Kurosawa has created a rich tapestry, specific to his historical moment, but with resonances for ours or any other age. Image Transfer Review: The black-and-white photography looks smashing here, and it's startling to see a Kurosawa film with this sort of use of depth of field. It's been nicely cleaned up and smartly transferred. Extras Review: A couple of recent titanic Criterion releases of Kurosawa films can leave you dizzy with extras; this is a more modest release, with the only notable supplement being the relevant installment (32m:32s) of Toho Studios' Akira Kurosawa: It Is Wonderful to Create, a retrospective on the making of the feature. It includes interviews with Kurosawa's production designer, cinematographer, script supervisor and assistant director; one of the five credited screenwriters; and cast members, including Kyoko Kagawa, and Tatsua Mihashi, who plays her drunkard of a brother. Especially interesting are the shots of screenplay pages, peppered with the director's stick-figure storyboard sketches. The accompanying booklet includes essays by Chuck Stephens and Michael Almereyda, and the newly retranslated subtitles include the occasional use of profanity, which no doubt must have been bowdlerized on the film's original U.S. release. Part Enron and part Arthur Miller, Kurosawa's noiry hash of Hamlet isn't the director's most tidy film, but it's brisk and visceral and still deeply relevant. No doubt I flatter myself by believing the title, and that therefore my insomnia is the mark of my good character; and a DVD like this is the very thing to pass the time in the dark of night.